The New York area got its first threat of winter weather on Friday — falling temperatures and precipitation set the stage for the prospect of snow. Not such a joyful winter wonderland prospect, actually, after last year’s traumatic season. But it did get us thinking about what happens when you combine hot cars and a cold climate. In the winter, the southern areas of the world are able to continue using their exotic cars without any worries about an influx of cold weather from mother nature. People in northern areas have it a little differently. While convertibles are roaming freely around Miami, cars in the North need to have their battery chargers hooked up, car covers put on — or have been stashed in winter storage. They will stay that way until at least all the snow has melted and the salt is cleared off of the roads, which means there will not be excitement on the highways and byways until at least March or April. But there has to be some way to keep a supercar on the road in these colder environments, doesn’t there? Supercars are starting to bridge the gap to become usable everyday rides. Visibility has improved, reliability is better, and more manufacturers have started to incorporate all-wheel-drive systems into their sexiest rides. All-wheel-drive is the key factor. In slippery conditions, AWD will provide more confidence to a driver than a rear-wheel-drive car would. Of course, in true snowy conditions, all wheel drive is useless without dedicated snow tires. But on a damp, cold morning, having four driven wheels will inspire confidence in the driver. If you’re in the market for a supercar but don’t want to store it all winter, we’ve taken the time to choose some AWD rides that will work for you all year long. The Continental GT is the most luxury oriented car on our list. A 570 horsepower W12 puts power to the pavement and lets this fancy ride cruise in comfort in any weather condition. 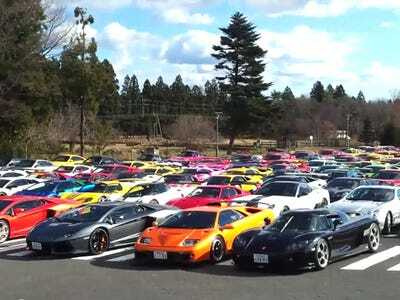 Now check out this supercar gathering.